It is always a pleasure to share enthusiasm with others, particularly so amongst fellow The Waterloo Association members. 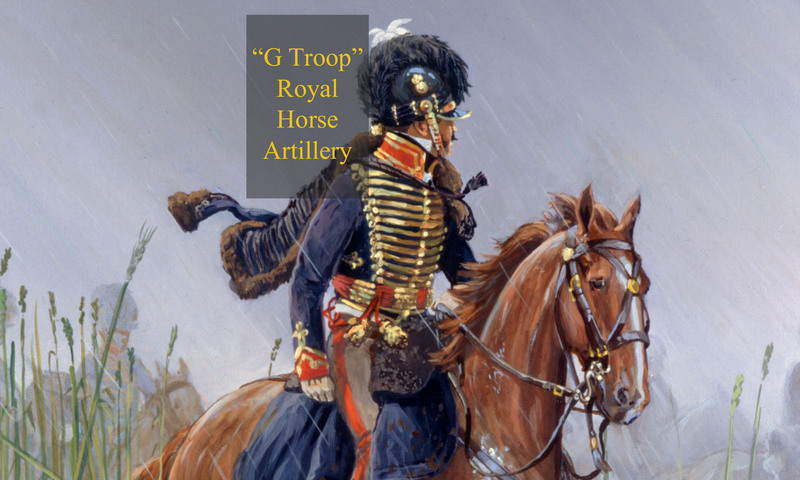 The Editor of the Waterloo Association Journal has kindly published this, the first of a series looking the evolution of properties on the battlefield, in Vol.38 No.3 Autumn 2016. The eagle-eyed will spot that this version is different, as the published version unfortunately omitted one of the postcards and comments. So read on for the full, as originally intended, real deal! Peppering the field of battle are properties that, despite damage on the day, have withstood the test of time. Maps, drawings, paintings, eyewitness and visitor testimonies attest to the destructive events that these properties suffered, endured and in many cases survived. Many of the precious original drawings and paintings of these battle-weary buildings handed down to us are interpretations of what the artist saw. Many more are copies or re-interpretations of another artist’s work by those who were never there, and so even in the months and years shortly after the battle the depictions vary enormously. The evolution of these evocative properties adds another dimension for the modern battlefield tourist. Since the adoption of the battlefield preservation act of 26th March 1914 no changes can be made to existing buildings or structures without government authorisation, indeed the Government is even authorised to expropriate them! The benefits to us now are incalculable. Yet well before Government intervened, the local community had an interest in preserving these buildings, as their homes, livelihoods, and to draw economic benefit from travellers keen to visit the furnace of Europe’s destiny. Soldiers, poets, clergy and artists drew the battlefield, but in time photography enabled postcards to record snapshots in time as the properties, and their immediate surroundings, evolved. 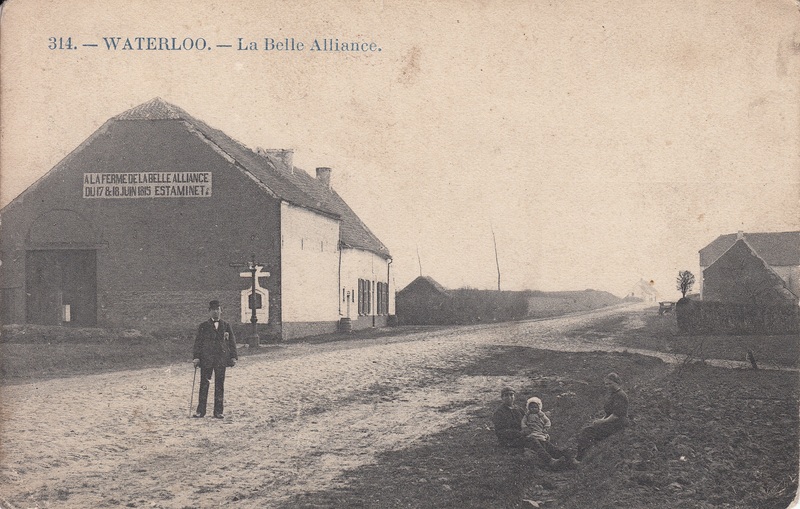 La Belle Alliance, centre of the French line, objective of the victorious allied advance and witness to the defeat of the Imperial Guard has an ample place in history. Its name was used for a celebratory square in Berlin, and it is, for many Frenchmen, still the preferred battle title. Looking back to the turn of the 18th Century the land on which La Belle Alliance now stands was in the ownership of ‘General Jaco’, a mercenary commander who was to embarrass a portion of Marlborough’s Anglo-Allied army in the first Battle of Waterloo in 1705, more of a night-time raid upon drunken troops, much celebrated in France and later described by Winston Churchill as the ‘unfought’ Battle of Waterloo. 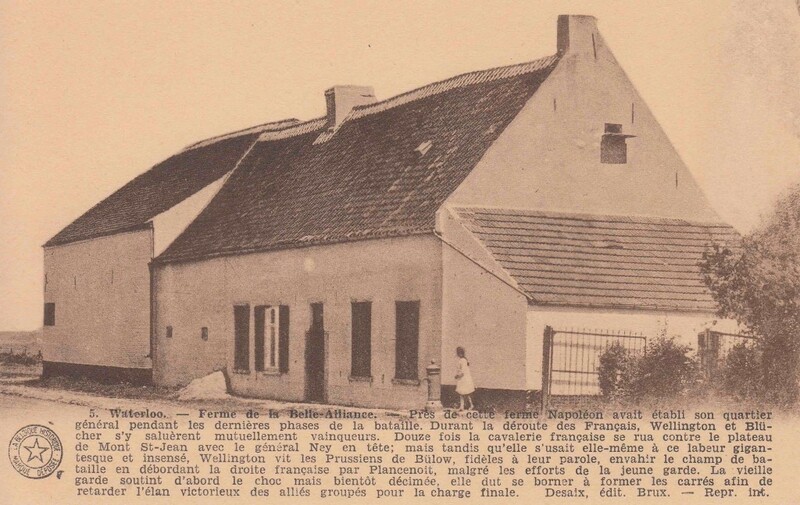 Construction of the main building, a farmhouse, took place in 1764/5. 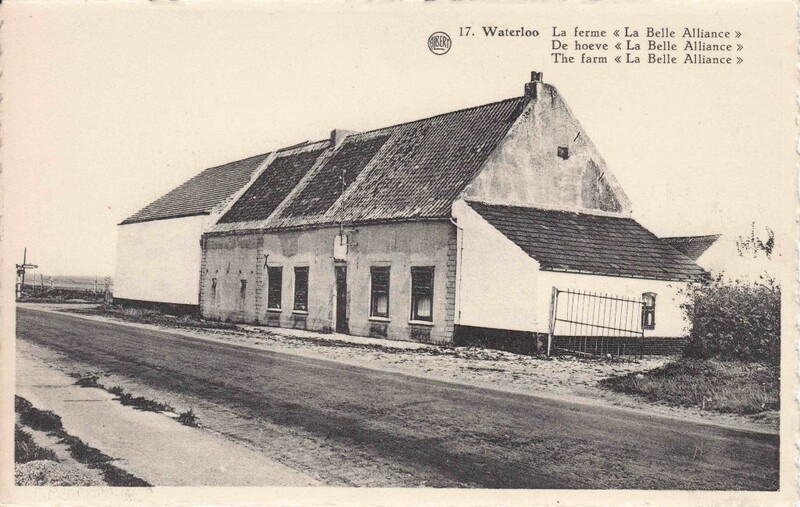 The barn at the back (Plancenoit side) of the main building was added in 1772, with a small bakery attached to the south. The largest barn that we see today, on the North side closest to the road junction, was built after the 1815 battle. 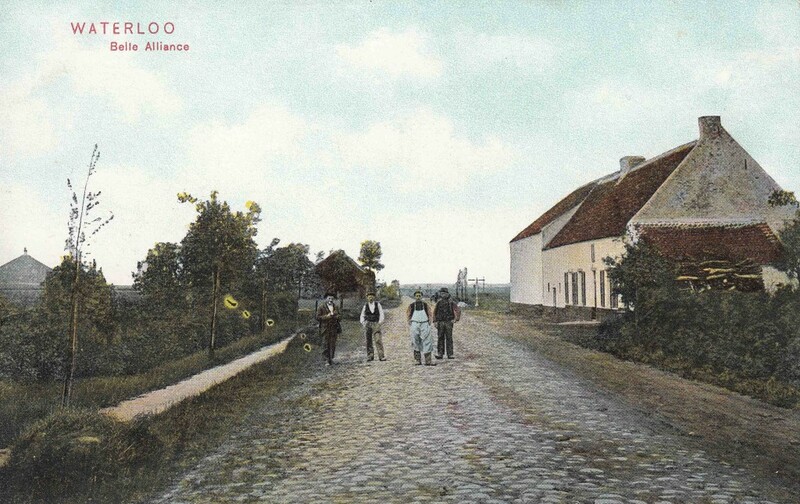 Paving of the route running beside the farm from Mont St Jean to Charleroi commenced in 1680, and took over 30 years to complete. The paving was some 2 to 3 meters wide, flanked by summer paths taking the total width to 5 to 6 metres. As observed on the 17th June 1815 on the allied retreat from Quatre Bras, the dust from coal carts drawn from Charleroi to Brussels blackened both the mud and many a soldier along the route. 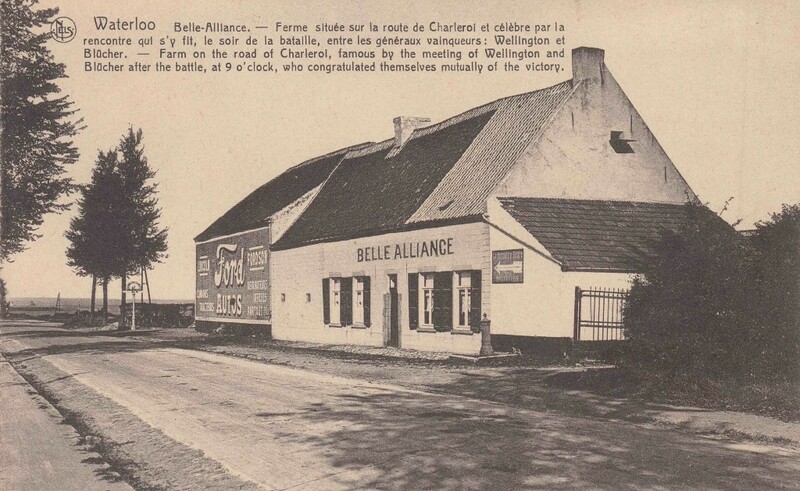 The name “La Belle Alliance” has been used as a backdrop to the successful partnership of Wellington and Blücher’s armies, adding froth to the dispute over the precise meeting place of Wellington and Blücher after the battle. Yet its name was established well before 1815. The beautiful 1777 cartography of Ferraris, an Austrian who mapped in detail and wondrous colour what is now modern-day Belgium, records the Cabaret La Belle Alliance as a cluster of three buildings. Local historians’ research has built on the observations of one of the early battlefield visitors, Walter Scott. The ‘old and ugly’ builder of the 1764 farm married, in the same year, an apparently beautiful young girl Barbe-Marie Tordeur, who died just a year later. She remarried in 1766, choosing a farmer from Plancenoit who died in 1770, whereupon she promptly married the farmhand, only to expire herself in 1777. It seems that the original marriage to the pretty peasant girl, or perhaps the regularity of marriage, raised some mirth within Plancenoit, encouraged by the local priest who coined the phrase “Belle Alliance”. Naturally, many variations of the tale exist! 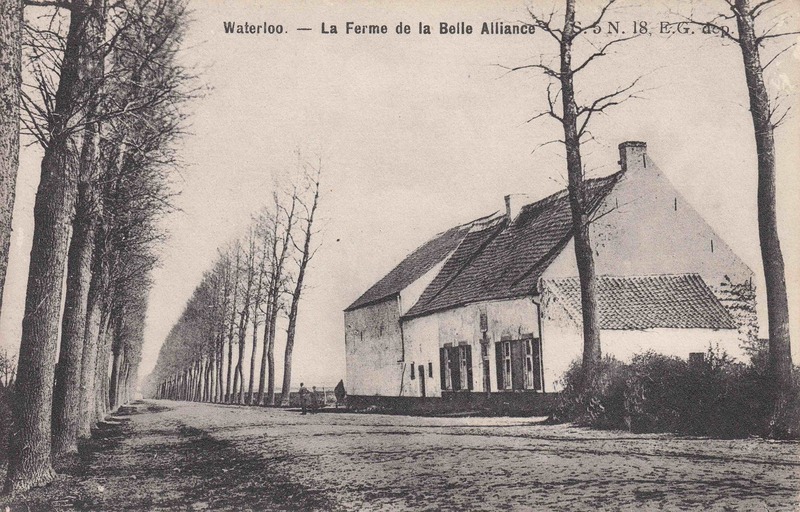 In June 1794 La Belle Alliance, now under new ownership, would have witnessed the march of the French forces on their way to secure their victory over the Dutch-Austrian army on Mont St Jean plateau and on to Waterloo, following up on their success at the Battle of Fleurus. One of their number was a newly- promoted 25 year old, Brigadier General Soult, whose return 21 years later as Chief of Staff was to be less successful. 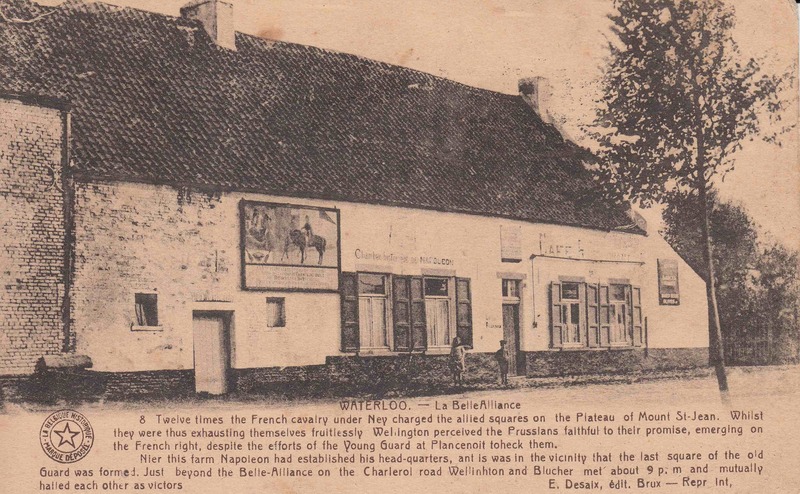 By 1815 La Belle Alliance was owned by a Plancenoit brewer who rented the premises to the innkeeper. Paintings in the aftermath of the 1815 battle show the roof-tiles dotted with artillery shot, with the barn behind depicted as a wreck. 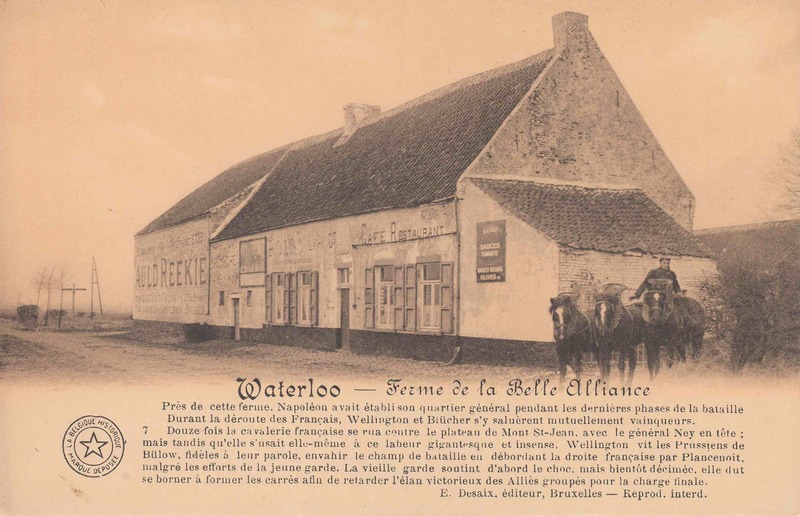 There followed five months of intense tourism to the ‘Hotel’ La Belle Alliance, and suspicion that the Inn was serving meat sliced from the victims of Waterloo, before the property was sold for a huge sum to a Glaswegian. With the demise of the travelling coal trade the inn lost its purpose, and by the mid 1800s it seems La Belle Alliance simply became a farm. But postcards show many interesting evolutions from this point. Poor La Belle Alliance. Within a few years of the battle it received royalty from the Netherlands, Russia, Prussia and Britain, since when it has attempted to re- invent itself many times. But standing alone, away from the attractions of the lion mound with its famed Panorama and succession of museums, it seems that it has always struggled to be little more than a shabby also-ran! If you can help to date the cards, or if you have a different opinion, or additional information to offer, please do get in touch. 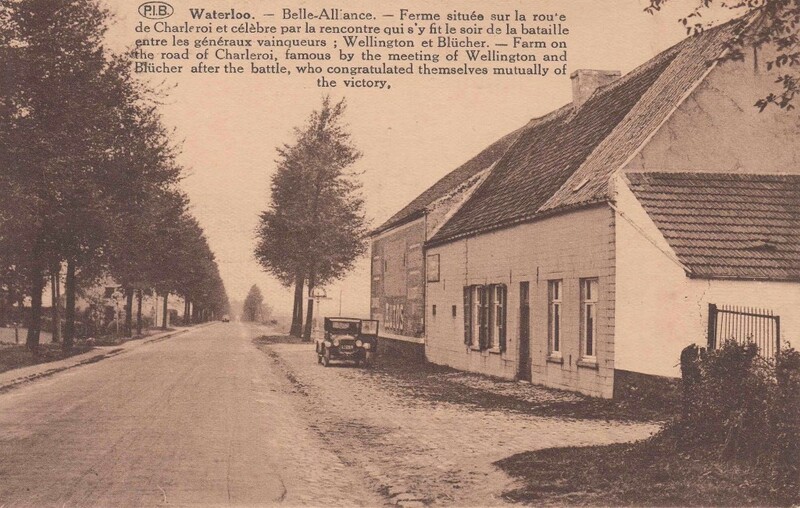 This is the first of a series of articles covering the evolution of different buildings on the battlefield, and your contributions and suggestions will be most welcome! Next up is Hougoumont. La Belle Alliance: au coeur de la bataille [Internet]. Version 1. micheldamiens. 2011 Dec 9. https://micheldamiens.wordpress.com/article/la-belle-alliance- 3cgja7u7z8vuo-4/. 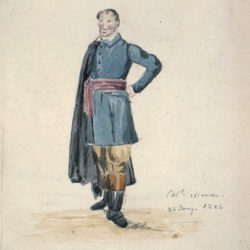 Jean-Phillipe Tondeur, Patrice Courcelle, Jean-Jacques Pattyn, Paul Meganck; Waterloo 1815 Les Carnets de la Campagne Nos.7 & 9.